Bitcoin had a decidedly mainstream moment this week: during a segment on the talk show hosted by comedian Ellen DeGeneres. She told her audience and viewers – which averages several million viewers per episode – to think of cryptocurrencies as a picture of a goat on the internet. “Now it’s adorable…and you want to pick it up and pet it. But you can’t because it’s not there, it doesn’t exist except for on that internet right there, just like bitcoin is digital currency,” she said. The comedian also poked fun at digital wallets, zeroing in on their vulnerabilities, while noting that they sounded like a Jimmy Kimmel stunt. “The digital wallet can either be apps on your phone, or tiny hard drives – which is a really good idea because who wouldn’t feel safe with their life savings on a piece of plastic that could go into the washing machine,” she quipped. 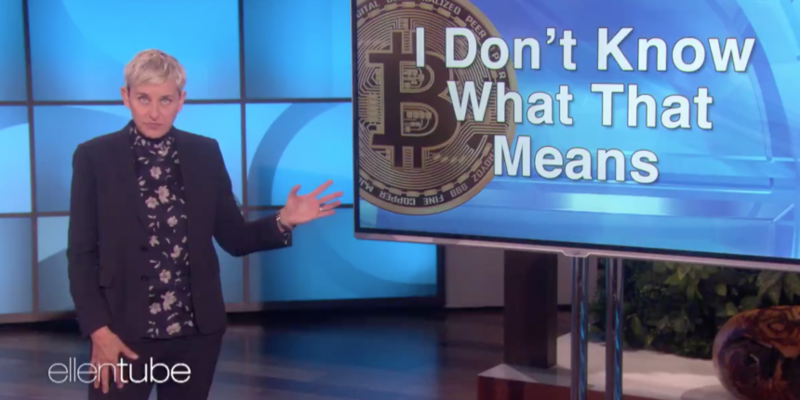 And while the bitcoin bit may be brushed off by some as a cheap gag, DeGeneres’ segment is perhaps reflective of how bitcoin and other cryptocurrencies have taken on greater prevalence in the mainstream consciousness. Other celebrities have helped to spur this along in recent years, with some making the news for their investments in bitcoin – like rapper 50 Cent – and others who have endorsed ICOs or decided to accept bitcoin as payment for their products and performances.